Over 60 councillors, officers and key decision-makers packed into County Hall North to hear how cycle networks are the key to health and independence throughout life. 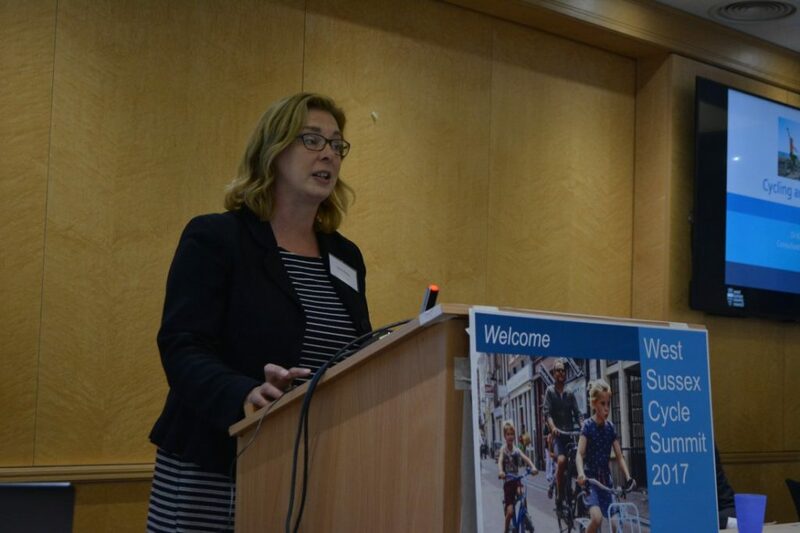 Opening the Summit, Rosemary French told delegates that as Chief Executive of the Gatwick Diamond she hears businesses in Manor Royal asking for safer cycle routes. Car parking is an expensive headache for them and they recognise that healthy employees are happier and more productive. Good local cycle links help attract highly skilled workers who want a healthy lifestyle, and that includes being able to cycle to work. The greatest benefit of improving cycle networks is to our health. Our residents tell us they want to cycle and they want their children to be safe to cycle. The biggest reason they don’t cycle is because the roads are too scary and dangerous. Rosemary explained that wherever good cycle networks have been achieved, this has been due to political will, as in London where there are hordes of cyclists of all types: commuters, shoppers, families and tourists. 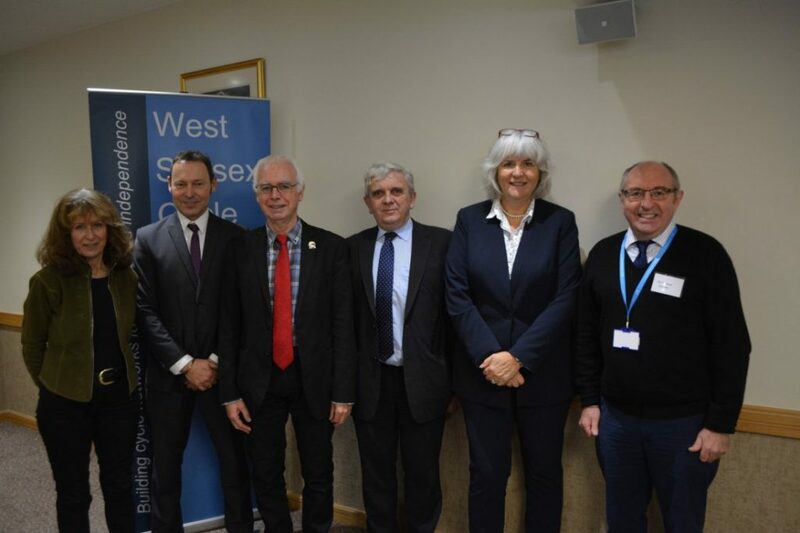 Dr Bailey, the West Sussex lead for wellbeing and healthy lifestyles, told delegates that the county is facing a public health crisis, with 4 out of 10 people not doing enough exercise. This is leading to increasing problems and costs with obesity. You can see Kate’s presentation here. Dr Aldred is the UK’s leading academic specialising in research on everyday transport. Last year she won the prestigious ESRC prize for Outstanding Impact in Public Policy for her work on identifying and overcoming the barriers to the wide uptake of cycling. Rachel began by explaining that cycling levels in the UK are very low by European standards and she highlighted that our poor cycling infrastructure is the key reason for this. Cycling in the UK is also very unequal: her research shows that women, the disabled and minorities are only about half as likely to cycle as men. These are the very people who are least likely to have access to a car. Astonishingly, more than 50% of commutes are less than 5km by car and less than 5% of them are cycled. Women and older people have a particularly strong preference for segregation from motor traffic, due to their lower risk tolerance. They are also less prepared to make long or hilly detours. 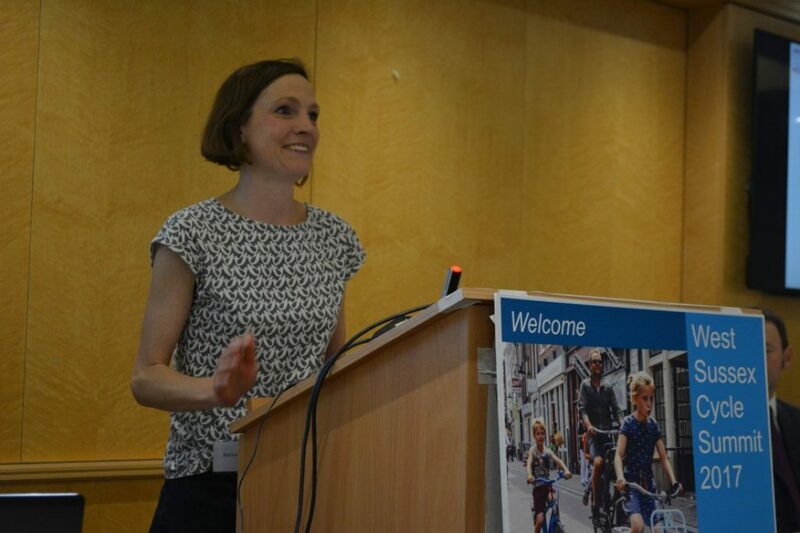 The audience was surprised to hear that in the Netherlands – which provides high quality segregated routes – people actually cycle more as they get older. Research in the UK has shown that even cyclists who are confident to ride on the roads as they are now are not prepared to cycle with their 8 year-old, or let their 12 year-old ride unaccompanied. Rachel presented a wealth of research, such as a study which showed that where there are parallel segregated and unsegregated routes, more women and younger and older people will choose the segregated route. 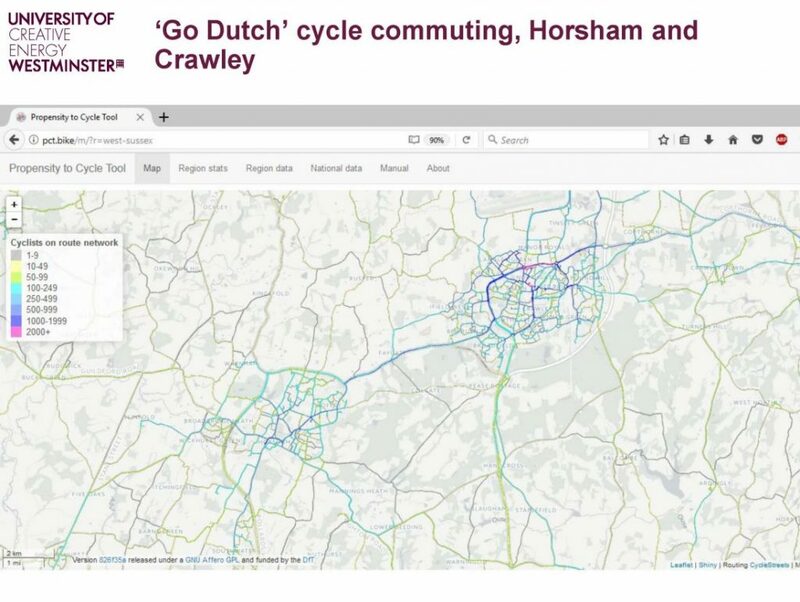 Running the Propensity to Cycle Tool (PCT) computer modelling tool for the route between Crawley and Horsham shows that cycle flows of 1000-2000 per day could be achieved with infrastructure to Dutch standards. 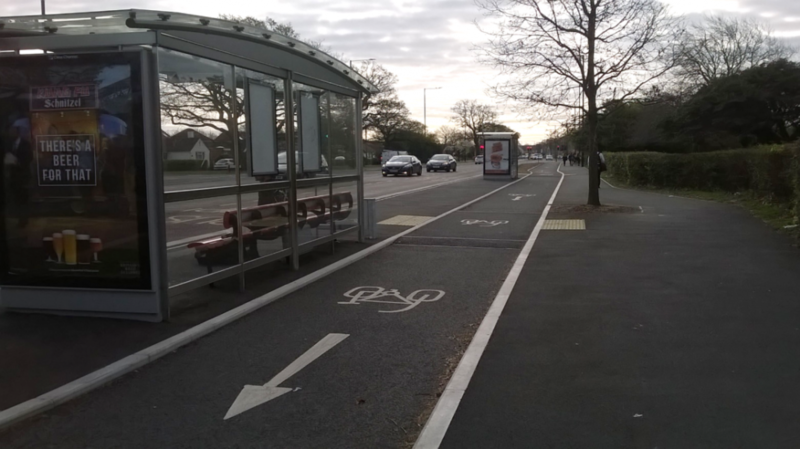 21% of commutes in West Sussex could be cycled if we provided Dutch levels of safety and convenience. Cycling can enable older people to continue to be mobile after they have stopped driving. Manchester’s Oxford Road segregated cycleway now carries up to 5000 people a day, with many older people using e-bikes. You can see Rachel’s presentation here. 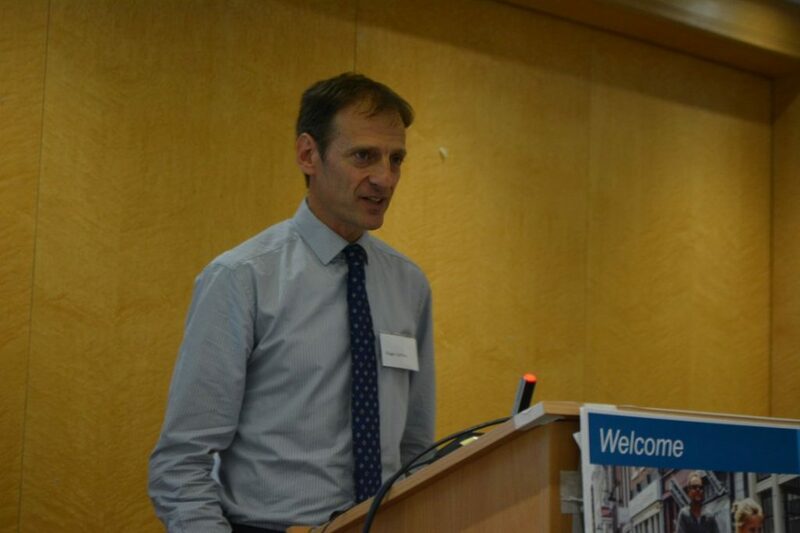 Andy has been leading the team behind the new West Sussex Walking and Cycling Strategy. Andy stressed that although people talk about there not being enough money, there are various pots of money available – but to access the money you need an adopted plan and a business case. Andy explained the policy framework that councillors need to work within, comprising a number of documents such as the Cycling Strategy, the Rights of Way Improvement Plan and Road Space Audits (there is one started in Chichester and one is about to start in Crawley). There has been an increase in KSIs on bikes since 2012, from 50 to around 80 per year. 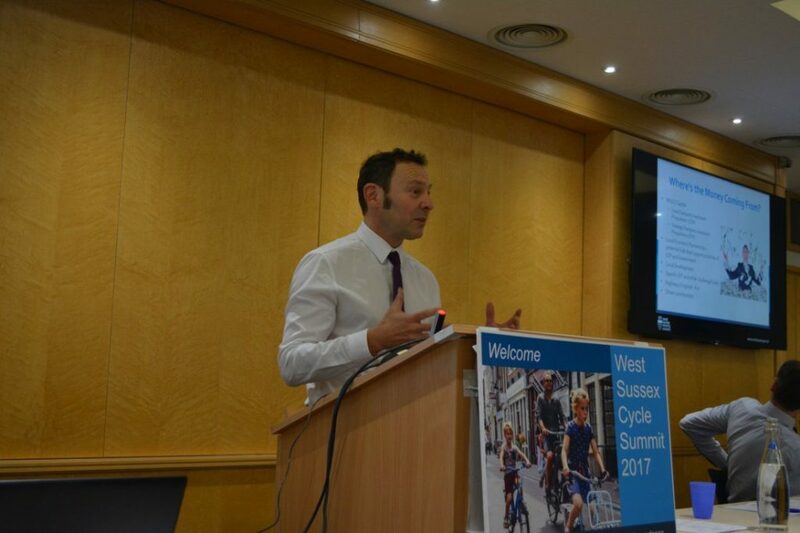 Andy announced that West Sussex has won Government support for developing Local Cycling and Walking Infrastructure Plans (LCWIPs) to the tune of 60 days specialist support. In summary, we have big challenges but the key is to work together and have an adopted plan for your network. You can see Andy’s presentation here. 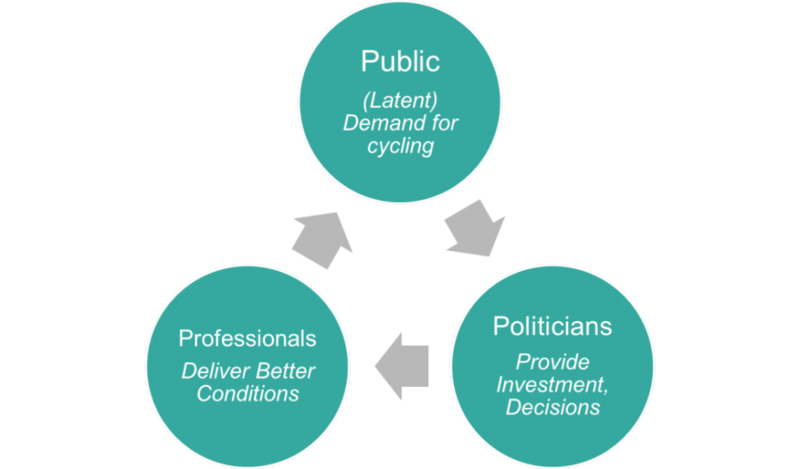 Roger, as Cycling UK’s Policy Director, has in-depth experience of national-level cycling policy. Roger agreed with Andy that the money is there, but noted that it has not been earmarked for cycling so local councils will need to have a plan to get it – and LCWIPs are the way to do this. Roger emphasized that the new Govt. LCWIP guidance is very good. 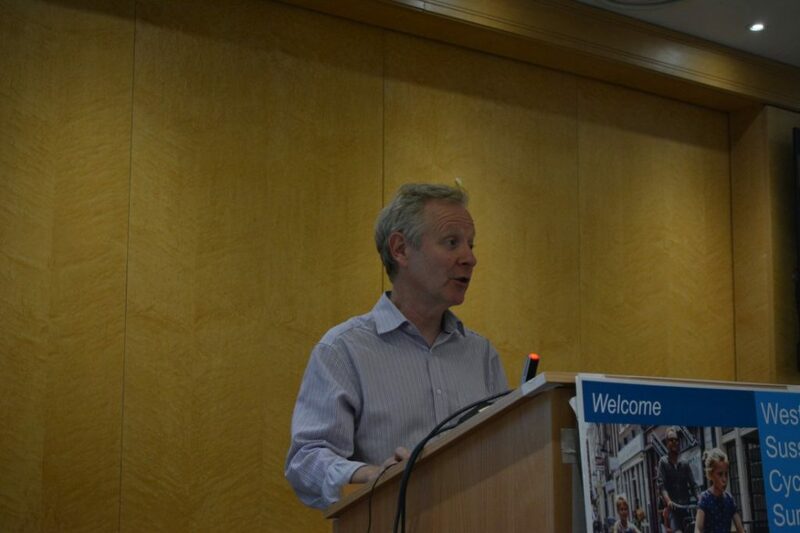 Roger gave examples of successfully working with councils. 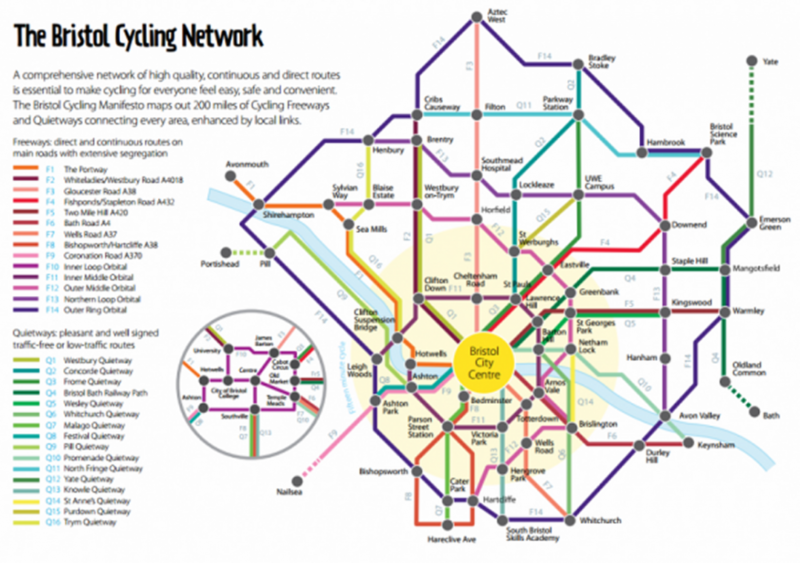 Some local groups have produced “tube-style” cycle network maps that are a powerful tool to show where the routes are needed. 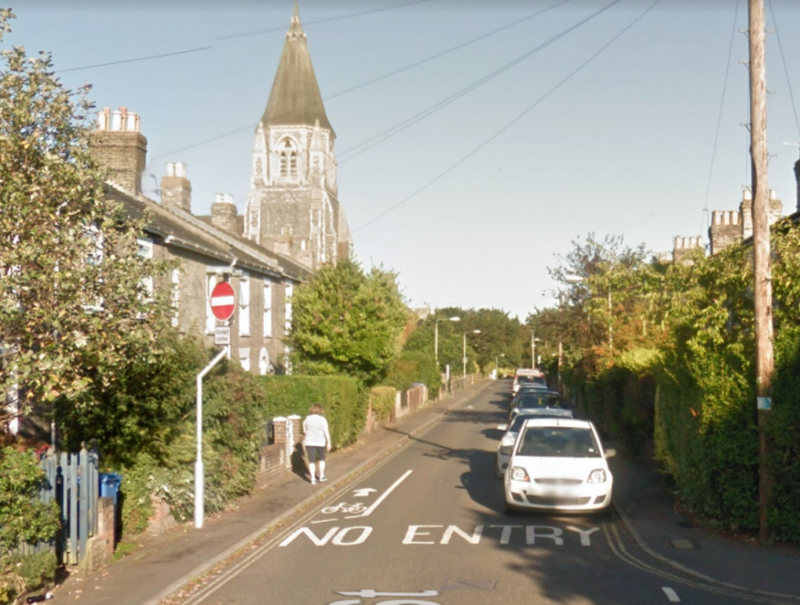 Cycle routes need to take people from their home to their destination. Off-road routes are a complement to the main network – but they are not enough by themselves. Roger re-iterated Rachel’s point that the cycle network should be suitable for an accompanied 8 year-old or an unaccompanied 12 year-old. Routes should be wide, well-surfaced, avoid conflict with pedestrians and be barrier-free. A review of design standards is needed to ensure high quality. You can see Roger’s presentation here. Bob Bayley from Cranleigh said the Surrey section of the Downs Link was being improved and wanted to know what West Sussex was going to do about improving the Downs Link in their section. Mark specialises in work on walking and cycling for councils and larger consultancies. LCWIPs need to be integrated into the local plan, for example they can be adopted as a Supplementary Planning Document (SPD). If there are significant changes in the area the plan may need to be updated (e.g. sooner than every 4-5 years). If you have a major development coming along there’s a case for getting the developer to update the LCWIP. You can see Mark’s presentation here. Phil has over 30 years’ experience in infrastructure planning and design, with particular emphasis in traffic analysis, transport planning and highway design. Phil presented images from the UK and around the world of successful cycle facilities and routes. And – equally important – all linked by safe and continuous junctions and crossings. 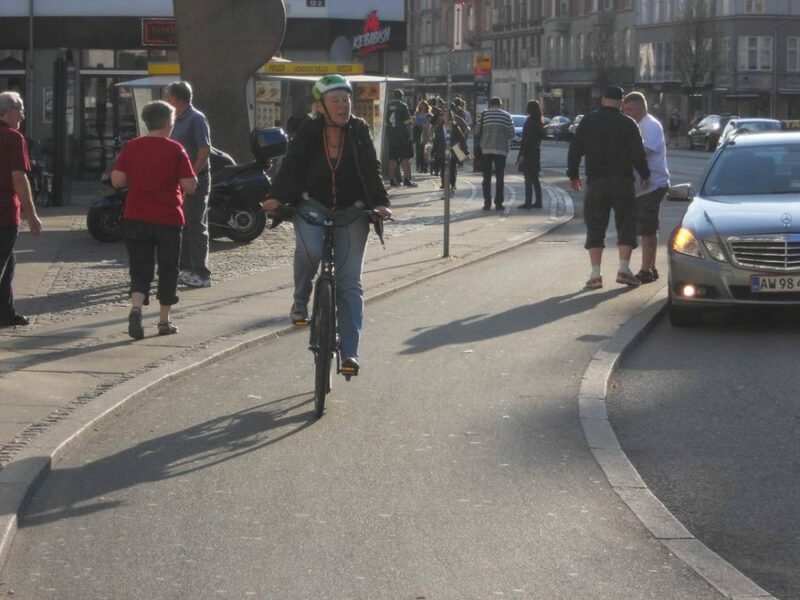 In the UK we still design a lot of shared-use, but Phil said that successful cycling countries avoid shared-use and treat pedestrians and cyclists as different modes, hence separate cycle tracks. 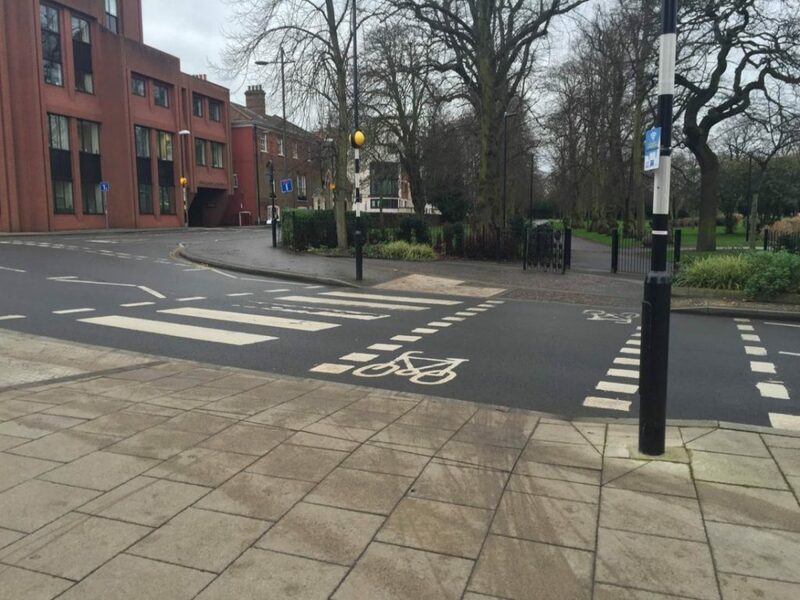 Stepped one-way cycle tracks can give cyclists priority at junctions, such as those used in Cambridge. Floating bus stops use cycle by-passes to take cycle tracks behind the bus stop and thus avoid conflict with bus passengers. Developers often build shared-use footways because they’re easy and cheap but they are not the way to do new developments. 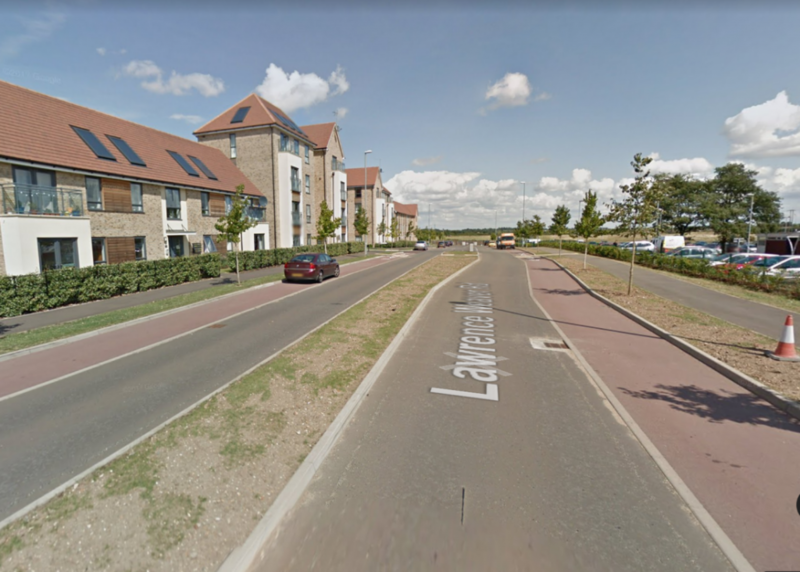 There should instead be with-flow segregated cycle tracks along spine roads, and this has now started to happen in places like Cambridge. For new developments, cycle and pedestrian routes should not only be considered within the development boundaries, but also within a 4 mile radius (for cycling) and 1 mile for walking. 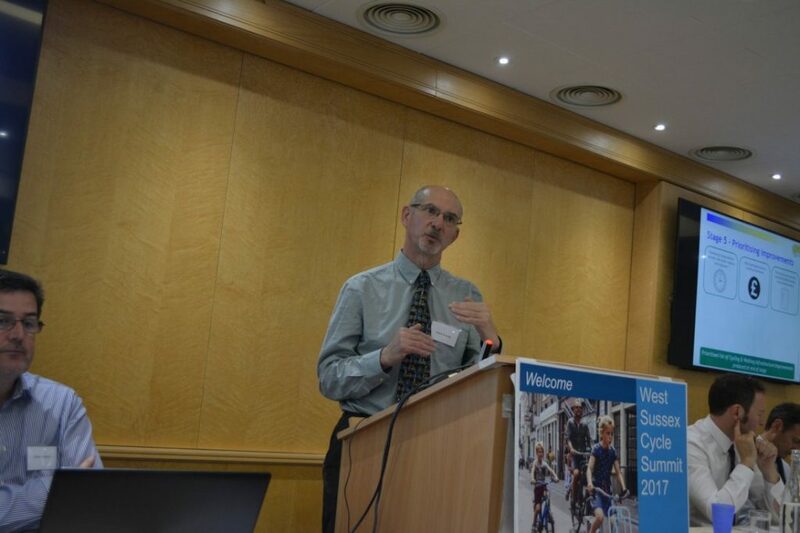 You can see further examples of successful cycle infrastructure in Phil’s presentation here. On the question of a Cycling Champion/Cycling Commissioner there was general support within the room for having a named person responsible for delivering cycle infrastructure, potentially both at District as well as County level. Cllr Bob Lanzer announced that Cllr Sean McDonald (Northbrook, Adur & Worthing) has just been appointed as Senior Advisor to the Cabinet Member on walking and cycling. Phil Jones, in summing up, drew from his experience of the successful London schemes where there is public demand for better cycling conditions which in turn drives politicians to provide the investment and decision-making that enables those conditions to be professionally delivered. Delegates heard how enabling cycling as a natural part of everyday activity can have a huge and long-term impact on health and independence for young and old. This is not really about “cyclists”: it’s about the whole community – including the many who don’t yet cycle. Delegates heard that the new LCWIPs – coupled with improved design guidance – are powerful tools to improve health and independence. All of the speakers’ presentations can be viewed here.